It was a race to the Greatest Athlete of All Time finish line and Bo Jackson edged out Jim Brown after careful consideration by the Sport Science team. Did they get it right? Cast your vote below. Vote: Greatest Athlete of All Time? It's hard to argue with John Brenkus and Sport Science naming Bo Jackson the greatest athlete of all time. Can you imagine another player ever earning MLB All-Star and NFL Pro Bowl honors in back-to-back years? But isn't arguing what we do best, SportsNation? Watch a special Sport Science Greatest Athlete of All Time broadcast on Sunday, March 10 at 3:30 p.m. ET on ESPN. 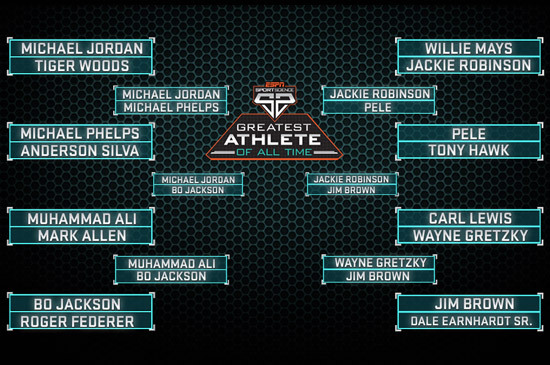 Who should have won the Sport Science Greatest Athlete of All Time bracket? Brenkus says: "Jackson's speed qualified him for the U.S. Olympic Team for track and field, but he pursued football and baseball instead. At the 1986 NFL combine, his time of 4.12 seconds in the 40 is still the fastest ever measured at any NFL combine -- and more than a tenth of a second faster than the modern combine record of 4.24 set by Titans running back Chris Johnson." Brenkus says: "A three-sport athlete in high school (football, basketball and baseball), the future Air Jordan was nicknamed The Rabbit for his ability to run a 40 in 4.3 seconds. As a high school pitcher, he once pitched 42 consecutive scoreless innings. Jordan scored in double digits in 1,108 out of the 1,109 games he played for the Chicago Bulls." Brenkus says: "Throughout his entire career, Ali only lost one fight by knockout. At that time, Ali was already 38 years old, coming out of retirement to face an opponent almost eight years younger." Brenkus says: "Growing up, Gretzky used his exceptional reaction times in sports other than hockey. In his teenage years, after Gretzky batted .492 for a semipro baseball team, he caught the eye of the Toronto Blue Jays and was even offered a contract. But of course, he chose hockey and went on to become the only player in NHL history to score 200 points in a season -- and he did it four times." Brenkus says: "In addition to numerous UFC and Pride belts, Silva has also earned black belts in Brazilian jiu-jitsu, taekwondo and Muay Thai." Brenkus says: "Federer credits playing basketball, cricket and badminton -- the fastest racket sport, with shuttle speeds over 200 mph -- for his exceptional hand-eye coordination. He's won 17 career Grand Slam titles -- the most all-time." Brenkus says: "Jim Brown is not only a member of the Pro Football Hall of Fame and the College Football Hall of Fame but also the College Lacrosse Hall of Fame. He was a lacrosse second-team All-American selection in 1956 and earned first-team honors in 1957, finishing second in the nation in scoring his senior year. Considered the best all-around athlete at Syracuse, he earned 10 varsity letters in four different sports (basketball, football, lacrosse, track)." Brenkus says: "Phelps' double-jointed ankles can reportedly bend 15 degrees farther than the average person, essentially turning his size 14 feet into large, flexible flippers. Phelps' giant 80-inch wingspan is 4 inches longer than predicted by the proportions of Da Vinci's Vitruvian Man." Brenkus says: "Pele turned pro at 15, joined the Brazilian national team at 16 and scored six goals in the 1958 World Cup at 17, making him the youngest goal scorer in World Cup history. In his career, Pele recorded 30 four-goal games, six five-goal games and one eight-goal game." Brenkus says: "At age 3, he shot a 48 for nine holes. At 6, he made his first hole-in-one. And at age 12, he broke 70 on an 18-hole course. Tiger turned pro in 1996 and in 1997 won the Masters by a dozen strokes. He's gone on to become the first athlete to earn more than a billion dollars." Brenkus says: "In his first year at UCLA, Jackie Robinson's worst sport might have been baseball. In football, he averaged 12.2 yards per carry as the Bruins' halfback. In basketball, he led the entire conference in scoring. And in track and field, he broke the conference long jump record and won the NCAA long jump championship. He was UCLA's first four-letter athlete." Brenkus says: "Even after nearly three decades, Lewis still holds the world record for indoor long jump with a distance of 28 feet, 10.25 inches -- nearly the width of a volleyball court. Even though he never played basketball or football in college, his speed, explosive leaping ability and pure athleticism got Lewis drafted by both NBA and NFL teams the same year." Brenkus says: "Mark Allen holds the record for the fastest marathon split ever in the Ironman World Championship, running the final leg in 2:40:04 in 1989. But running isn't his only strength. In college at UC San Diego, Allen was an All-American swimmer." Brenkus says: "The 12-time Gold Glove winner, fourth on the all-time home run list, learned to hit a ball before he could walk. Baseball was actually his third sport, after football (quarterback and punter) and basketball, in which he led his high school team to a state championship." Brenkus says: "Known as one of the toughest drivers in NASCAR history, Earnhardt once raced Watkins Glen only two weeks after breaking his sternum and collarbone. Both steering and shifting with only one hand, not only did he win the pole, Earnhardt led 51 of the first 54 laps on his way to a sixth-place finish." Brenkus says: "The Birdman might be most famous for being the first skater to land a 900, but his incredible agility on a deck and in the air actually enabled him to pioneer many more gravity-defying acrobatics, including a backside varial, airwalk, stalefish, 720, kickflip McTwist, varial 720 and stalefish frontside. All told, Hawk invented nearly 100 tricks which are now staples in the sport." Sorry, but you can only select up to 0 options. Please review your selections and try again. ESPN Sport Science started with a bracket of 16 athletes, chosen by SportsNation, and applied its unique metrics to determine which players would advance and who would ultimately walk away with the title of Greatest Athlete of All Time. Tune in for a special Sport Science broadcast on Sunday, March 10 (3:30 p.m. ET, ESPN) for more insight into the project. "SportsCenter" and ESPN Sport Science teamed up to determine the greatest athlete of all time, using their unique metric that factors in attributes such as speed, power, reaction time and more. Your votes determined the athlete who would represent each sport in the bracket phase of the project and then Sport Science host John Brenkus delivered the results of each matchup, culminating in Bo Jackson overcoming Jim Brown to earn greatest athlete of all time honors. Tune in for a special Greatest Athlete of All Time broadcast on Sunday, March 10 (3:30 p.m. ET, ESPN).